The Spur Wheel is a large horizontal cogged wheel that is situated at the bottom of the Main Shaft. It can be seen at ceiling level of the Ground Floor. 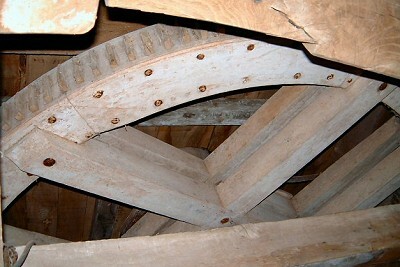 The purpose of the Spur Wheel is to transmit the rotation of the Main shaft to the Stone Nuts and thus the Millstones.